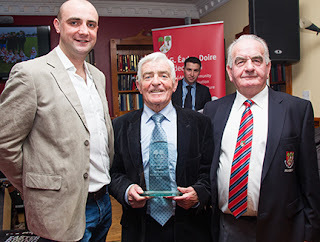 The annual Edenderry GAA Club awards were presented on Saturday night last in front of a packed audience in Byrnes Lounge. Colm Cummins Chairman of Edenderrry GAA Club explained that the club felt it very important to recognise the achievements of players, club officials and supporters and that the awards were a small way for the club to thank all for their efforts during 2012. The citations for each recipient were read by MC for the evening Eamon Horan of RTE Sport. A special award was presented to Kym Furey and Christine McDonnell to recognise their achievement in winning an All Star Award fro their efforts in playing with Offaly in the National Leagues. Our Club Supporter of the Year was presented to Peter Forde. Peter is an ever present at Offaly and Edenderry games throughout the county as he follows the fortunes of his favoured "Reds" and "Faithhful County". The award shows the clubs gratitude to a man who is always encouraging of all club teams from his grandson's U8's to our Senior footballers. Our Club Person of the Year was unable to attend on the night, however as the award recognised his committment to running the weekly Bingo at the clubhouse it was fitting that Aidan Burke was presented with the award at the Bingo on the following night. Aidan is one of the main organisers of the Bingo and sees this a s his contribution to the club and one that we certainly as very grateful for. The Hall of Fame award was presented to Micheal (Micky) Nolan who has given a lifetime of service to the club. He won his first county medal in 1946 and followed this with SFC medal in 51,53 & 57. He also served the club as selector in 95 & 97 when we won two more SFC titles. A very well deserved award for his lifelong dedication to the club. Our award winner certainly had a very busy 2012, playing Minor, U21 & Senior Football for Edenderry, Minor Football with Offaly and Colleges Football with St Mary’s. He will most definitely remember the year just passed as he helped his school to win the Hogan Cup in Croke Park in April. A tenacious defender who isn’t afraid to roam forward and take a shot at goal or kick a ’45 over the bar, a player with an exceptionally bright future……………our 2012 Minor Football of the Year is Sean Moriarty. This player also had an extremely busy year and is also the holder of a Hogan Cup medal with St Mary’s. He also represented the club at U21 & Senior level and is currently a member of the Offaly U21 Football panel. A stylish forward who has a keen eye for goal and is always ready to take on a defender, an exciting prospect for Club & County ……………….our U21 Footballer of the Year is Sean Doyle. Our Junior Football award winner is one of the most committed players in the Edenderry squad at present. An almost ever present at training in 2012 and always willing to play in both Div 1 & Div 3 games……some even on the same day. A tough tackling, resilient defender who can fit in anywhere in the team when required, …………….our 2012 Junior Footballer of the Year is Stephen Abbott. Our Junior Hurling award goes to one of our seasoned campaigners. This player has been an ever present on the Junior Hurling team for many years. A very accurate scorer when playing in the full forward line and a great play maker when positioned further out the field………. our 2012 Junior Hurler of the Year is Shane Kelly. The recipient of this year’s prestigious award has a long association with the Club. As a young man he was heavily involved in the Development Committee that constructed the Pavilion - over 40 years ago - and served in many other capacities over the years too. As his children grew up, he followed the Reds and Offaly through some great years in the 80’s & 90’s. As a result, he had some great days out and was well renowned for singing the odd song on buses destined for Croke Park! His recent retirement has given him the time to get to a huge amount of games and he is now supporting his grandchildren and following Offaly in both codes and in all weathers! He may have slowed up a little but this Life Member of Edenderry GAA wears his colours on his sleeve!!!! This award aims to recognise outstanding contribution by a particular member. We are lucky to that we could give this award to many of our members however this year it goes to man that has served in many positions within the club and the latest of which is very important. Every Sunday night without fail from 6pm to 10 pm this man gives his time to the club to ensure that main fundraiser, our weekly bingo runs smoothly and continues to thrive. He just sees it as his contribution to the club and gets on with the job without any compliant. As a club we are very lucky are delighted to be in a position to recognise his super efforts. In 2012 our Senior Football award winner represented his college NUIG in the Sigerson Cup and the Connaught FBD League, playing at midfield in the final. He was also positioned at midfield for Edenderry in their run to the semi final of the SFC and his absence in the Semi Final proved to be a real loss to the team. His high fielding and distribution of the ball were noted in all games he played in during 2012 and earned him a call up to Emmet McDonnell’s Offaly Senior Football squad in the Autumn, making his Offaly Senior debut in the recent O’Byrne Cup games. Our Senior Footballer of the Year for 2012 and a real future leader for the club is Stephen Guing. This year’s recipient won his first football Co. Championship medal in 1946. He was on the school team that brought The Ennis Cup back to Edenderrry Boy’s National School for the first time. This team remained together, winning the Co. Juvenile Football Championship in 1949. The same team went on to win the 1951 Minor Co. Championship. They scored a record 87 points over 4 matches; this record remains unbroken to the present day. He won his first senior Co. Championship medal in 1951, he picked up another Championship medal in 1953 by helping his team overcome their old rivals Rhode in what is regarded as one of the finest games of football ever witnessed in Tullamore. When the final whistle sounded this man was carried shoulder high by Edenderrry supporters, in recognition of his skill on the field that day. He went on to win his 3rd senior football championship medal in 1957 He represented Offaly in minor and senior football. This man had another string to his bow. He was a gifted hurler and won his first junior hurling Co. Championship medal in 1953. He crowned 1953 by playing on the Offaly junior hurling team, winning a Leinster junior hurling title. They were beaten in the all Ireland junior hurling final by Tipperary. He went on to add an intermediate hurling medal to his total in 1954 playing with Edenderrry. He was on the Edenderrry teams that won The Phoenix Cup in 1959 and 1960.He again collected junior championship honours in 1962 and won an Intermediate medal in 1963. An all round sportsman, when he retired from contact sports he tried his hand at Golf. He mastered the game very quickly and reduced his handicap from 18 to 6 in less than 3 years. Representing Edenderrry Golf Club with his playing partner the late Tommy Conlon, they remained unbeaten in match play over 8 years. His glory hour in his golfing career came when in 1967 he won the Captains Prize. He went on to serve as Captain of Edenderrry Golf Club in 1987. He returned to his first love of GAA in a working capacity as a selector with Edenderrry Seniors winning the Co. Championship in 1995 and 1997. His proudest sporting moment was when his son Paul, captained his Edenderrry school team to victory in 1985 in the Vocational Schools All Ireland Final. He remains a staunch supporter of all sports but especially Gaelic games. Please be upstanding to welcome our Hall of Fame recipient Michael (Mickey) Nolan.